Taking a road trip and need to keep kids busy? We found the perfect thing... Chalk Mats. 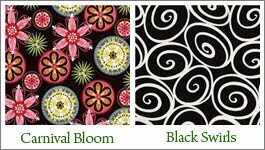 These designer mats are made with a soft 'chalkboard' on one side and designer fabric on the other. 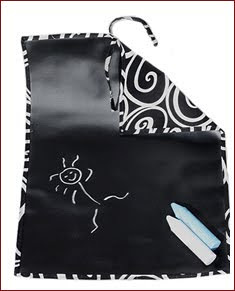 Your kids will love creating their own masterpiece on the chalkboard surface while riding in a vehicle. They clean easily with a damp cloth, ready to start again. These wonderful little mats are available at Bonita Boutique. Each chalk mat measures 14 in. X 18 in., and they roll up and tie for stashing in a diaper bag or backpack. The Chalk Mats come in 6 different designer fabrics like the ones shown here. For a road trip, or a trip to the grocery store, these are just what the Mother ordered to keep the kids busy and entertained. You just may begin to wonder how you ever got along without them!